We have started a new donation based Mindfulness Meditation class at Bristol Yoga Centre. This is part of a new programme of community classes that we introduced recently so that more people can come to our classes. It’s our strong belief that classes should be accessible to everyone. There are currently three community classes available and people can pay whatever they can afford. See here for more information. The profit from my Mindfulness Meditation class goes to Bristol Mind, a mental health charity based in Bristol. Bristol Mind was originally founded in 1965 and aims to promote a positive view of mental health and encourage emotional wellbeing. It was important for me to have a sense of give and take for the community class so that we are not just doing our practice for ourselves but also for others. People will be benefiting from the practice and their money will be going to a really good cause. The idea developed after I completed a foundation in teaching Mindfulness Meditation earlier this year. I’ve been interested in meditation for some time and studied BWY Meditation module several years ago as well as attending regular weekly classes. I’ve gained so much benefit and wanted to share the practice with others. When I regularly meditate, I feel connected and relaxed not just during and after the class but also in everyday life. It was quite different experience from my asana (posture) practice. It’s much more refined and subtle but powerful and profound. My mind is clearer and settled yet focused and steady. I am much more aware of my actions and able to be in the present moment. As an Indian Philosopher, Jiddu Krishnamurti said ‘to understand the immeasurable, the mind must be extraordinarily quiet and still’. "Naomi's mindfulness meditation classes have given me a new depth which I had not known, or given time to explore, and which I've found extremely beneficial to my every day life. The way she incorporates breathing exercises, sound, sensation and body movement gives my practice an added immersive dimension so I'm excited to come and learn something new each week. Naomi is a profoundly knowledgeable teacher but she keeps the sessions accessible, creative and playful. The classes have given me a sense of spaciousness and sensitivity to my responses to daily life and I have felt able to be more peaceful, focused and in tune with myself and others." It’s really fantastic that we are all able to practice together and I’m really happy about how it’s going. Usually we do two short sitting practices, gentle stretches and asanas, pranayama and relaxation techniques. I try and use yoga techniques to settle the mind and body in preparation for mediation. So far, we have been working on different themes every week, from importance of breath to learning how to relax. We also set aside a bit of time to discuss how it’s going so that people can learn and share from each other. I believe that students really benefit from sharing experiences and it helps to create a wonderful communal feel. If you’re interested in the class, come and join us. My meditation class is on every Wednesday from 10-11am. Absolutely everyone’s welcome. "In the beginner's mind there are many possibilities, but in the expert's there are few. " I have just completed a Mindfulness Meditation teaching course at Yoga Campus and one of the first handouts we were given was on Zen’s way of Beginner’s Mind. This reminded me of an excellent article on the subject that I was given for my BWY Foundation course in 2003 with Sally Worth. It’s written by Eric Gregory in 1986 and I believe he is one of the oldest members of BWY (he’s 100 years old and recently featured in their magazine!!). The writing is simple and I love the way that it beautifully describes mindfulness in our everyday life and yoga practice. It’s one of the documents that I give to my Foundation course students, now that I teach the course. I thought I would share this excellent writing on mindfulness in our yoga practice and life. In his book "The Dancing Wu Li Masters", the author Gary Zukav records a conversation he had with AI. Huang. Al. Huang is a famous teacher of Tai Chi in America. This is another characteristic of a Master. Whatever he does, he does with the enthusiasm of doing it for the first time. This is the source of his unlimited energy. Every lesson he teaches (or learns) is a first lesson. Every dance he dances, he dances for the first time. It is always new personal and alive." This approach is what is known as 'Beginners Mind which is a term used in Zen to indicate the way in which one should approach life. It means having a fresh uncluttered approach to everything, free from prejudices, ideals, and preconceptions. Unfortunately our minds are cluttered with prejudices ideals and preconceptions and these colour everything we do and think! All this clutter means that we do not approach anything with an open mind. We always expect something or other. We all have a Yoga posture that we find difficult or do badly or just plain do not like. So when this comes up in class, our mind immediately fires back to the last time we did it - and didn't enjoy it - and so we approach it with foreboding. We say to ourselves "That always hurts, (or is uncomfortable)" or "Everyone else can do this better than I can and I shall stick out like a sore thumb! ", and so on. Whereas, if we could do it with ‘Beginners mind’ we would simply experience the posture without making any judgement as to whether or not it was easy or difficult, comfortable or uncomfortable, or whether or not we were doing well or poorly. And we would do it to the very best of our ability. Bikram Choudhury wrote "Perfection is the very best you can do at the time". Unfortunately we all have the ideal performance in our mind and become very disappointed or desperate or push ourselves too hard, when we fall short of our ideal. This idea is not meant simply to apply to our practice of the postures. It applies to life as a whole. We all look back, I am sure, to early childhood when the world was a fascinating place to explore and full of things to discover. I love to see a young child watching, with intense concentration a bee in a flower or an ant walking up a piece of grass. There is total absorption and one can apprehend the feeling of wonder the child is experiencing. Alas, as we grow older we become ‘more sophisticated’ which means we have our mind full of value judgments against which we measure everything. Thus the bee on the flower or the ant on the grass stalk are hardly noticed or if they are, they are noted as ‘just a bee’ or ‘an ant’ and not worthy of attention - we have "more important things to do!" If you think about it, you will see that we are living in the past, judging the present in terms of past experience. So we never have the present as it is here and now - to be experienced and enjoyed. No two situations in life are ever the same. No two sunsets are alike, no two flowers are alike – all is changing as we ourselves are. If we crystallise our response to everything in terms of the past, we loose precious opportunities of experiencing the wonders of life around us. The most sophisticated person is also the most blasé and bored person. The most powerful way of becoming aware of the wonder of life is to be told one has only few months to live. Then one looks at everything with a new eye! So why don’t we start whilst we have (hopefully) a bit longer to do it in? How often do we pour ourselves a cup of tea without much attention. Next time, pay close attention. Notice the stream of tea as it leaves the teapot, see the colour of it, how it glitters in the light, how it flows into the cup notice the curl of stream. Enter fully into the experience. I always tell my students that they do not come to class to do Yoga! They come to learn the techniques of Yoga – they do Yoga in the rest of their lives – in the remaining 166 hours of the week! In a Yoga class one should learn something about oneself. Do you approach the posture aggressively trying to lambaste your body into doing your will! Do you ‘freewheel’ at the more demanding postures – making a good show but not really trying? Do you become tense in a posture? Do you use more muscles than are needed? Have you found that a relaxed approach enables you to go further? Do you ‘throw it away’ – i.e. as soon as the teacher tells you to stop, do you whip out of it, thankful that it’s over? All your reactions to how you do the postures will mirror the way you approach situations and problems in life. If on the other hand you can start to work with a ‘Beginner’s Mind’, you will approach each posture or each situation in life with the attitude of “let’s see what this feels like today” or “what are the possibilities in this for me today”. Of course, past experience is useful, but only as something to use in present circumstances where it can help. The wrong attitude is where our past experience is allowed to colour or prejudice our attitude and so prevent us from fully experiencing or learning from, or solving our present involvement in a situation. A further complication can be that a lot of our past experiences that colour our attitudes are not even our own. We are greatly influenced by the opinions of others – our parents, our brothers and sisters, our teachers, our school friends, TV, Films, advertisements, books and a host of other prejudices, ideas over the years. So, by the time we are adults, we have very little of our own, that is, that which we have arrived at independently of other influences. All these things we must learn not to throw away but allow them to stop us from experience life, freely, joyfully and to the full. I hope you enjoyed reading this article! I’ve been teaching Lion’s pose recently and noticed that people were more chatty and energetic after class. This is a seated posture incorporating a powerful breathing technique. When you look up the benefits of this pose, it says that it helps to improve your communication and bring shy people out of their shell. It certainly gives people more to talk about afterwards, as you make a very expressive face (sticking your tongue out and rolling your eyes back) and make a loud sound! Other benefits include strengthening the throat, preventing ear problems and even warding off colds! It’s also one of the common exercises used in face yoga as it strengthens the facial muscles and throat. It’s said to maintain your jaw line and prevent sagginess. Personally, I’ve found that it’s a great for eradicating feeling of lethargy and sluggishness as it’s very stimulating. Due to the use of a strong outbreath with a roaring sound, it’s a great way to release pent up emotion and tension too! In the Hatha Yoga Pradipika, a classic fifteenth century Sanskrit manual on yoga, says that Simhasana ‘is held in great esteem by the highest yogis. This most excellent asana facilitates the three bandhas’. The traditional seated position used in Simhasana induces the three major Bandhas or locks. Bandhas are used to control the flow of energy and prevent prana from dissipating. They are therefore sometimes translated as 'seals'. When all three locks are engaged, it’s called ‘Maha Bandha’ or the great lock. In yoga Maha Bandha is highly regarded and recommended. In a culture where it’s deemed important to look cool and beautiful, this technique might put some people off. It usually sets off some giggling in the class! With this impressive list of the positive benefits of Simhasana, I think it’s worth risking looking a bit strange or foolish. So next time you’re in need of a little pick me up or feeling a bit stressed, try using your lion/lioness power! I recommend doing this in a private place, not because you might look weird but it might scare people!! 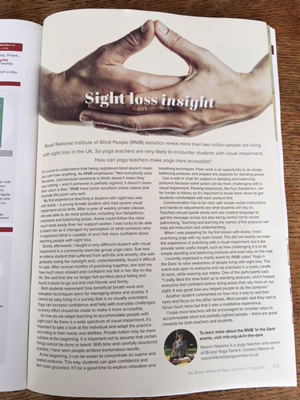 I’ve just received the Spring issue of Spectrum, the official magazine of the British Wheel of Yoga (BWY), and really excited to see another of my articles featured! Last year, I wrote an article on the balancing benefits of yoga retreats and this year on how yoga teachers can make classes more accessible for students with visual impairment. In the UK, there are more than 2 million people living with sight loss. For yoga teachers, this means that we are likely to encounter students with visual impairment and it’s important that we try to make yoga accessible for them. It’s crucial to understand that being registered blind doesn’t simply mean you can’t see anything. As Royal National Institute of Blind People (RNIB) emphasise: ‘Not everybody sees the same. Just because someone is blind, doesn’t mean they see nothing – and if someone is partially sighted, it doesn’t mean their vision is fine’. RNIB have some excellent online videos which illustrate this point very well. My first experience teaching a student with sight loss was with Anela, a young female student who had severe visual impairment since birth. After a year of weekly private classes, she was able to do most postures, including Sun Salutations, inversions and balancing poses. Anela could follow the class much more easily than her support worker! I was lucky to be able to teach her as it changed my perception of what someone who is registered blind is capable of and I felt more confident about teaching people with sight loss. Shortly afterwards, I taught a very different student with visual impairment in a Community Exercise group yoga class. Sue was an elderly student that suffered from arthritis and anxiety; she was also gradually loosing her eyesight and understandably found it difficult to cope. After several months of practicing together, she told me how much more relaxed and confident she felt in her day-to-day life. She said that she no longer felt terrified about falling and found it easier to go out and visit friends and family. Both students expressed how beneficial breathing practice and relaxation techniques were for managing stress and anxiety. It cannot be easy living in a society that is so visually orientated. If yoga can bring more confidence and help with everyday challenges, then we should make every effort to make it more accessible. So how do we adapt our teaching to accommodate people with sight loss? As there is a wide spectrum of visual impairment, it’s important to take a look at the individual and adapt the practice according to their needs and abilities. You will need to decide whether private tuition may be more suitable at the beginning. It is crucial not to immediately assume that they cannot do certain things or learn to do them. With time and carefully structured practice, I have seen people achieve tremendous results. At the beginning, it can be easier to concentrate on supine and seated postures. This way, students can gain confidence and feel more grounded. It’ll be a good time to explore relaxation and breathing techniques too. Floor work can be a great opportunity to do simple balancing postures and prepare the students for standing poses. Use a wall or a chair for support in standing and balancing postures, as some poses can be really challenging when you cannot see. Flowing sequences such as Sun Salutation can be harder to follow so it’s important to break it down and get students really comfortable with each of the postures first. Our communication has to be clear and simple as your verbal instructions and ‘hands on’ adjustment are what they’ll be relying on. Try to speak slowly and use creative language to get your message across but be careful not to sound patronising. Teaching the names of the postures as they are learning will help with your instruction. When I was preparing for my first lesson with Anela, I tried practicing yoga with my eyes closed. This did not exactly recreate the experience of practicing with a visual impairment, but it did provide some useful insight, such as how challenging it is to do simple standing and balancing postures and even stay on the mat! Another student commented on how nice it was to rest the eyes and focus on the other senses. Most people said they had to concentrate much more but it was a meditative experience. Teaching people with limited vision makes you really concentrate on your communication and adjustment skills. I hope that more teachers will be encouraged to consider ways to accommodate blind and partially sighted people, as there are great rewards for teachers and students alike. Now that the Christmas season is over, people are eager to start something new and to try and stick to their New Year’s resolutions. There is a buzzing in the air that’s hard to ignore! Around this time, we get lots of new students joining and although it’s a good time to start new classes, it’s important to slowly build up your practice. You may feel attracted to active yoga classes but it often makes sense to take your time and work more gently in the winter. In nature, everything slows down: many animals hibernate and plants even die back to prepare for spring and the activity ahead. It makes sense to take a leaf out of nature's book and practice in a way that honours the season. This should help to avoid ‘Blue Monday’ which falls around the third Monday of January and is said to be the most depressing day of the year. It’s believed that Blue Monday occurs because of a combination of factors like cold weather and failing our New Year’s resolution, but I believe one of the main culprits is exhaustion. Many people end up feeling like they need to accomplish lots of things at the start of the year and end up burning out. Instead of (literally) running around trying to do everything, it's best to slow down and focus on things that energise us. After the festivities, I’ve also been feeling tired and dispersed. It was a lovely break with plenty of socialising with family and friends, but once I was back at work there was lots of catching up to do! I felt like I should be doing more, but deep down I knew that I first needed to slow down and rejuvenate. So recently in my practice, I’ve been focusing on restorative postures and slow long held sequences that encourage concentration and grounding. I’ve also been doing more breathing and relaxation techniques to revitalise. It’s really important to observe and adjust our practice to honour where we are. This can be challenging as we often end up doing things that we think are right rather than really listening to ourselves. Spending some time at the beginning of the practice to feel and reflect on our experience is essential. Our practice can then help us achieve more balance throughout the changing seasons. What is your original nature, snow man? This is the time of the year when people start thinking about making New Year resolutions, but I have always felt a little sceptical as they are often forgotten or ditched within a few weeks. ‘You set your intentions based on understanding what matters most to you and make a commitment to align your actions with your inner values. As you gain insight though meditation, wise reflection, and moral living, your ability to act from your intentions blossoms’. Sankalpa comes from Sankskrit word ‘San’ which means altogether and ‘Kalpa’ from ‘Kalpana’ meaning idea or vow. This is often translated to will, purpose or determination. It also means connecting and committing to our highest truth. It is believed that the concept of Sankalpa stems from the Vedic times. A Sankalpa practice starts from the radical notion that you are already who you need to be and you only need to look deep inside you to find your true purpose in life. Discovering your Sankalpa is about really listening to the deepest part of yourself. It’s completely opposite to believing that some how you are not good enough unless you achieve certain goals or get what you want. Sankalpa should provide you with true self-confidence and peace of mind and assist you to overcome challenges in life. Just knowing your Sankalpa then becomes a blessing and a guide, independent of whether you achieve certain goals or not. Manana: To be able to welcome and take in the message. Nididhyasana: To respond and act your Sankalpa with commitment. One of the most powerful practices for planting the seed of Sankalpa is Yoga Nidra (yogic sleep). Yoga Nidra systematically relaxes the body and mind and guides you into deep awareness. You are aware and awake but you experience a disidentification from the body and mind. As Anne Douglas, a yoga therapist explains, ‘In Yoga Nidra, we discover a profound level of openness. Our self-imposed limitations dissolve, and we are pure being’. Sankalpa are made and repeated three times at the beginning and at the end of Yoga Nidra. Your resolve should be in the form of a short positive statement set in the present tense and normally starts with ‘I am...”. For example, I am peaceful, I am compassionate or I am free. It should be repeated with feeling and commitment. Naomi will be running ‘Yoga for the New Year’ workshop, which will takes a look at the concept of Sankalpa (positive intention) and apply this to a meditation practice. For meditation practice, you can try going to our weekly class called ‘Meditate, relax and stretch’ with Kay on Wednesday morning or attend her workshop ‘The deep quiet within - Meditation & Practices’. To experience Yoga Nidra, you can sign up to ‘iRest Yoga Nidra workshop’ with Sara-Jo in the New Year. I realised that I’ve mentioned Pawanmuktasana in couple of my other blogs (Sukhasana and Yoga for Neck & Shoulders) previously and haven’t yet explained what it is! Pawankuktasana is a series of exercises developed by the Bihar School of Yoga to free-up tension, improve circulation and limber the whole body. It’s a gentle and effective movement that can be practiced by everyone. It works by using slow repetitive movements with the breath. You probably have come across some of these exercises in your yoga class as they are often used as a warm up. In Sanskrit ‘Pawan’ means wind or energy,‘mukta’ means release, and ‘asana’ are the postures, these remove blockages especially in the joints and muscles. This is why Pawanmuktasana is some times translated as the Joint Freeing Series. Mukunda Stiles, founder of Yoga Therapy centre, condensed the Pawanmuktasana series to a shorter more accessible format. See here for an example of his work. This is an excellent progressive sequence that gently works the whole body. I’ve used this sequence in my yoga classes and students have commented on how relaxing and meditative it is, they were also surprised how energised they felt afterwards. Pawanmuktasana series are referred to as Sukshma Vyayama, which actually means subtle practice. As Swami Satyananda Saraswati says, ‘it should never be ignored and treated casually just because the practices are simple, gentle and comfortable’. The easy joint and muscle movements not only increase flexibility of the body, but also the mind. As the mind focuses on the movement, breath and energy, it begins to settle and relax. Our practice then becomes an exquisite moving meditation. It’s beautiful to witness this in action, as Leonardo da Vinci says ‘simplicity is the ultimate sophistication’. On a recent holiday to a small cottage I quickly noticed that there was no WiFi! This forced me to have a week (almost) without looking at a screen. I was amazed how much tension was released from my upper back. I’ve always had tension in my shoulders and I tried lots of different techniques from physiotherapy, acupuncture and massage but none of them had any lasting effect. On the first day back to work, I immediately noticed tension creeping back in my head, neck and shoulders. Our sight is of the most stimulated senses so it’s really beneficial to rest our eyes regularly. Staring at screen for long period of time can easily lead to headaches and tension building up in the neck and shoulders. I understand that mobile devices are really useful, but it’s important to try and take some time off whenever you can. Take the time to relax completely in Savasana (full relaxation pose) for at least 10 minutes every day. Try using an eye pillow or something to cover your eyes to help you to relax more easily. Your eyes and brain are closely associated and it will help to settle your mind. Don’t forget to switch off your mobile! Our posture has major effect on our body and if we spend a lot of time hunched over our desk, the muscles in our upper body can get tight and unbalanced. Even if you don’t have a desk job, we tend to do repetitious work, which causes tension and imbalance. Doing regular asana (posture) practice is a great way to improve your alignment and increase your awareness of your posture. Whenever you sit, or do any activity for a long period of time, try to be aware of your posture and encourage balance. We tend to carry lots of tension and stress in our shoulders; this is partly because our head is comparatively heavy for the intricate neck muscles. We easily get into the habit of rounding our shoulders and jetting our head forwards, bringing lots of strain into our neck. We can sometimes grip through our jaw and tense our arms and hands, which also causes the upper-body to become tight. Pawanmuktasana exercises are designed to release tension in the joints and muscles. Series 1 is especially good for relaxing the shoulders, arms and hands. Many of the exercises are gentle circular movements that are great for soothing aches and pains. Breathing properly is one of the most important ways of reducing stress and tension. Most of the time we should be breathing slowly and deeply, but unfortunately many of us have learnt to breathe shallow and fast. This way of breathing can lead to unnecessary tension in the neck and shoulders, especially when we breathe into our upper chest instead of the diaphragm. It’s made even worse by bad posture: squashing the front body makes it harder for us to breathe easily. Whenever possible practice abdominal breathing. Remove any tight clothing especially around the chest and waist so that the breath can move smoothly. Make sure that there is plenty of space in the front body, especially your chest and the belly. Visualise breathing down into the belly to slow and lengthen your breath. Five good reasons to do Ashtanga Yoga regularly! Astanga yoga is one of the most popular styles of yoga currently practised. It was developed by Pattabhi Jois during the 20th Century. It’s a vigorous and intense form of yoga, and many of the flowing styles of yoga including Vinyasa Flow and Power Yoga have been derived from Ashtanga Yoga. Practicing Ashtanga yoga will quickly increase strength and stamina as the sequences are powerful and challenging. It’s a great way to improve fitness level and you will quickly notice your development. Ashtanga yoga uses Ujjayi pranayama (ocean breathing) throughout the practice and it’s a great way to keep the mind connected to the breath and increase lung capacity. It will also teach you to breathe deeply and smoothly in other aerobic exercise, which in turn will help your performance. Ashtanga yoga uses Drishti for developing concentration. Drishti means internal gaze and it’s a great technique to improve balance and keep the mind focused. In a group class, it’s easy to be distracted by other people, using Drishti helps to keep the mind on your practice. Ashtanga yoga follows the same sequence each time so it’s easier to memorise the practice and start doing it at home. The more regularly you practice, quicker you will see the improvements. We have Thursday morning Ashtanga led class at Bristol Yoga Centre restarting from September and it’s perfect for beginners and improvers! Our practice should teach us to have a mountain of resilience and an ocean of patience. At face value Tadasana (standing upright) seems to be one of the most basic postures in yoga. However, the term ‘basic posture’ can be misleading, which is why I prefer think of it as one of the fundamental poses. ‘promotes the experience of stillness, strength, relaxed power, and immovable stability associated with mountains’. It’s a wonderful posture that reminds us the importance of stability, lightness and balance. Tadasana acts as a blue print for all standing postures as it shows us how to bring these essential qualities into every pose we practice. It’s easier to feel grounded and effortless in Tadasana, and once you have experienced these delightful attributes, you can translate them into more complex postures. Whenever I practice challenging poses, I try to bring a sense of balance even when the pose seems uneven and twisted. I focus on being stable and balanced, and then explore ways of being light and expansive. This method allows you to breathe properly and start to relax into the position. One of my teachers often says that practicing Tadasana illustrates the earth and sky relationship perfectly. When you stand well, there is a feeling of being supported by the earth, which in turn enables effortless lift towards the sky. It’s a great pose to explore your relationship with gravity and space, and feel how they work together in our practice. Tadasana encourages better physical posture and teaches the mind to be steady and calm. Every time we practice, we can reacquaint ourselves with stillness. As Schiffman says… ‘remember that experiencing yourself in stillness is the most direct way to experience yourself with clarity’. Tadasana allows you to establish this deep connection with yourself. So next time you’re on the mat, rather than rush through Tadasana, try spending some time experiencing this incredible posture fully. What is Scaravelli Inspired Yoga? Scaravelli inspired yoga is a gentle yet powerful form of Hatha yoga that uses gravity and breath to release the spine and energise the body. This approach focuses on ‘the intelligent heart’, an innate sense of our natural patterns of movement to bring harmony and ease to the asanas (postures). 'If you are kind to your body, it will respond in an incredible way'. Interestingly, Vanda never wanted her approach of yoga to turn into a method or a style of yoga. This is why teachers who currently follow this method of practicing often refer to as ‘Scaravelli Inspired yoga’ or ‘In the Spirit of Vanda Scaravelli’. To find out more about this interesting practice, we spoke to Kate Fox. Kate teaches monthly Sunday Scaravelli inspired yoga session at the Bristol Yoga Centre. I discovered Yoga in my early twenties, but it was only when I discovered Scaravelli Yoga, that I began to fully understand what yoga is fundamentally about and how it could help me. I was always trying too hard, forcing my body to do what I thought it needed, or what I thought it should be doing. Fixed on trying to ‘perform’ what I thought an asana should be, or should look like. But what I began to realise is that it’s not about trying to force the body into a set of rigid poses, it is about learning to let go of tension and habits that limit our movement. My focus is now on approaching asana from within. When we 'tune in' with the inner-workings of our body, we can begin to move towards each asana with a new awareness that prevents us from imposing on the body. We can begin to identify any tension, dullness and old habits that exist. With some gentle encouragement, we can gradually begin to disperse these, cultivating new habits that will help to make you physically and mentally stronger. This cannot be hurried and will only get richer and deeper with practice, patience and time. Scaravelli inspired classes are suitable for everyone including complete beginners. It is also great for experienced students who are looking to deepen their practice. I have practiced yoga first thing in the morning for several years and believe that it’s the best time to do yoga. Here are 3 good reasons to do yoga in the morning. At the end of the day when your feeling tired from work, it can be hard to motivate yourself to get on the mat - even if it’s a lovely thing to do! Also, if you’ve already completed the practice in the morning, you can go home and relax or go out instead. Why don’t you try coming along to our fabulous morning classes at Bristol Yoga Centre? To see Bristol Yoga Centre's full timetable. It’s an exhilarating and fun way to learn jump back and it’s incredibly strengthening. ‘Jump back’ is often used in Ashtanga style of sun salutation sequence. I found that people were less intimidated by bunny hopping, perhaps because of the name! In this method, you will be coming into a posture called ‘Malasana’ (wide squatting position). Practicing Malasana is a fantastic way to open the hips and strengthen the legs, ankles and feet. I recommend that you warm up by doing movements that open the hips such as ‘Anjaneyasana’ (low lunge) and ‘Prasarita Padottanasana’ (wide-legged forward bend. Also try doing some ‘Half Sun Salutation and Modified Sun Salutation’, and release the wrist and ankles by gently circling through the joints in both directions. How to do bunny hops by Naomi from Everyday Yoga & Bristol Yoga Centre. Start in ‘Adho Mukha Svanasana’ (downward facing dog). Begin by stepping one leg at a time, forwards and back few times. When your comfortable with the movement, try hopping both feet forwards, just behind your hands, and gently hop back into downward facing dog. Repeat this several times. On your last go, try holding in Malasana for several breaths. Return back to downward facing dog and rest in ‘Balasana’ (childpose). Finish your practice by doing ‘Savasana’ (Full relaxation pose). Finally take a few moments to feel the effects of the practice by sitting in a comfortable seated posture and contemplate on Haiku poem on spring by Osho, Zen master. And the grass grows by itself. I wanted to share this brilliant breathing technique that I learnt from one of my yoga teachers some time ago. I’m not sure if it’s a classical Tibetan breathing technique, as I’ve never come across this anywhere else but it’s a great introduction to alternative nostril breathing or Nadi Shodhana. Nadi Shodhana means ‘purifying the channels’ and balances the pranic energies by controlling the airflow through the nostrils. This technique is excellent for beginners as it’s simple and easy to follow. Similar to Anuloma Ujjayi (another simple alternative nostril breathing), this technique is excellent for beginners as it’s simple and easy to follow. You don’t even need to be able to do Ujjayi pranayama or know how to hold Vishnu mudra, a hand gesture used in alternative nostril breathing. If you are new to pranayama (yogic breathing techniques), it’s worth reading my previous posts on breathing technique and seated postures. To gain the most benefit from pranayama it’s best to be taught in person by an experienced teacher. - Lying on the side of the body: If your left nostril is blocked lie on right side and vice versa. - Practicing Padadhirasana, the breath balancing pose (see picture below). Sit tall in Vajrasana or a comfortable seated position that supports the spine. Cross the arms in front of the chest, placing the hands under the opposite armpits with the thumbs pointing upward. Close your eyes and start to focus on the breath. Allow your breathing to be smooth, deep and rhythmical. Practice for 5 – 10 minutes before pranayama. If you’re still congested try visualisation techniques instead. With this breathing technique, you could even do the arm movements but omit holding the nose down. Raise your right arm up as you inhale through both nostrils, as you exhale block the right nostril and breathe out through the left. On your next inhale, raise your left arm up and when you exhale block the left nostril and breathe out through the right (this completes a full round). Continue like this for 6 - 12 rounds. Sit and observe the effects of your practice. If you feel dizzy or unwell during the practice, stop and bring your breathing back to a normal. If you have a regular pranayama practice, you can alter breathing ratio and slowly introduce breath retention. This breathing technique can be practiced before or after the asana session. Relax your shoulders, face and neck and try to keep an upright spine. Avoid pressing too hard on your nose and be delicate with the use of your hand. Gradually lengthen and deepen your breathing. Take your time to practice slowly and try to feel the effect of the pranayama. The immediate effects of pranayama can be subtle but with regular practice, you will notice that your mind is clearer and your concentration will improve. It’s said to be great for reducing stress and overall you will feel more balanced and energised. Pranayama is used for dharana (concentration) and preparation for dhyana (meditation). I have personally practiced pranayama over the years and have noticed a massive improvement in my mental and physical wellbeing. I found that I am more grounded, centred and relaxed. I recently went on a long yoga retreat weekend in Suryalila in Spain. This was a proper yoga retreat centre that offers yoga teacher training as well as Permaculture courses. The property sits on 45 acres of land and is still a working olive farm with 350 olive trees! It was such a wonderful experience. The food was healthy and delicious, and most of the vegetables and fruit were from their garden. It was either vegan or vegetarian food and the daily changing menu was creative and exciting. The accommodation had everything you needed. Enough space to truly relax…even had an outdoor swimming pool! The staff and yoga teachers were all very helpful and kind which helped to make you feel at home. Yoga was held in their famous Om dome, which has been voted ‘the most magnificent yoga hall in Europe’. Practicing yoga in the dome with a view with beautiful rolling hills and large open valley were truly inspiring. They also had two other lovely practice spaces too. We did two yoga practices daily but as it didn’t feel too much as we did restorative yoga, breathing techniques and meditation practices in the afternoon. There was plenty of free time and optional massage facilities, which I took full advantage of. After the holidays, I felt balanced, refreshed and energised. I was ready to come home and take on a new exciting project. Prior to going to the retreat, I was offered a great new opportunity and it was a perfect place to contemplate. Excitingly, I will be running a yoga retreat this year in Tarifa. This is a luxury 7 day holiday in a gorgeous Villa La Peña From Saturday 17th - 24th June 2017. Villa La Peña is located in a stunning elevated position in the La Pena area (Natural Park) of Tarifa, nestled between mountain and sea with a panoramic view over miles of sandy beaches. It faces the Strait of Gibraltar, looking out east across to Morocco's Rif Mountains and west to the Port of Tangiers. We now have only few spaces left! ‘Proper relaxation is a gift everyone of us should give to our bodies each and everyday’ - Tara Fraser, a senior yoga teacher. After the Christmas and New Year, we often take up new activities and projects, and run around trying to achieve our goals. Whilst it’s a great time to take on new things and reflect on our intentions, it’s really easy to over do it and end up feeling burnt out. Relaxation is a key element in yoga practice; Savasana or ‘the full relaxation pose’ is the ultimate position for relaxation…as the name implies. It is one of the most important asanas as it teaches us how to release physical and mental tension and assimilate the practice we have completed. Allowing time to reflect and absorb our actions will enhance their benefits. It’s easy to over look simple poses like Savasana but I have found that it’s often one of the most powerful ones to do regularly. Savasana teach us important lesson of letting go. Experts believe that one of the primary causes of chronic stress is inability to release worries and strain. We often hold on to these feelings and tension even when the stressful situation has long passed. Practicing Savasana regularly is a great way to notice how we are and encourages us to let go. Savasana is often translated as the corpse pose and is synonymous to Mrtasana, which means death pose. The pose symbolises death and letting everything go. No longer trying to do or analyse but letting everything be as it is. At a first glance, it may seem like the easiest pose to practice but it can actually be one of the hardest postures to do properly. It can be challenging to relax fully whilst maintaining full awareness. It’s very easy to be lost in our thoughts or just fall asleep! As with most things, the more you practice, the easier it becomes; so I recommend doing this pose regularly. Savasana is normally practiced at the end of asana practice but it can also be done at the beginning or on it’s own. When I feel depleted and tired, I often spend 5 -10 minutes (longer if I have the time) in Savasana to rejuvenate. It has a quality of a power nap and is incredibly restorative. As Gheranda Samita, one of the three classical text on Hatha Yoga says ‘Lying flat on the ground like a corpse is called Mrtasana. This posture destroys fatigue, and quietens the agitation of the mind’ - Chapter 2, verse 11. After practicing Savasana, the body feels rested and the mind becomes less cluttered and clearer. You will also have more energy to do what you want. To practice this pose, it’s important to spend some time ensuring that you are as comfortable as possible. Make sure that you are lying down in a balanced way and allow yourself to relax completely. Use as many props as you need such as blankets, cushions and eye pillow. Blankets can be placed over the top of the body to keep warm or folded up and placed under any part of the body for support. Cushions can be used to prop up the head or used under the knees to release your back. I highly recommend using eye pillow as it will help you to relax your face and head. Experiment and see what works for you. If you are pregnant, it’s not advisable to spend too long on your back so choose to lie down on the left side of the body. Once you are in Savasana, gently watch over your body, breath and mind. Try to observe your thoughts without becoming attached to them, by feeling your body and keeping yourself connected to the ebb and flow of your breath. Simply learning to observe your thoughts in this way will help to calm your mind. If you are worried about falling a sleep, try setting a timer or a gentle alarm. When you are ready to end the practice, come out slowly and take the time to notice the effects of Savasana. Sit quietly and observe how you feel. I promised some of my students I'd provide some home practice sheets for them to use over Christmas and New Year while my classes are closed. I thought I'd post them up here so you can all have a go. I tried to create a short rounded practice that is accessible for everyone. There are two sheets: ‘Balanced Home Practice’ and 'Half & Modified Sun Salutation'. It’s optional to do half or full sun salutation and the number of rounds you do is up to you. If you have trouble accessing these files, feel free to contact me. Try to avoid drinking or eating prior to practice and wear comfortable clothes that enables you to move freely. Use whatever props and modifications which are necessary to suit your needs. Try to really connect to the body and avoid over-doing it. Remember to keep breathing slowly and deeply without forcing. One of the most common mistakes is to rush. Take your time and do your practice slowly and mindfully. If you enjoyed the practice and are looking for more, there are many good online yoga classes available. I recommend https://www.ekhartyoga.com/ and https://www.gaia.com/yoga but both have a subscription fee. Alternatively you can use Youtube or use google search to find free yoga videos. Whilst online videos are great, I think it’s also important to do home practice quietly so that you can focus and connect to yourself more easily. I have recently written two blogs on home practice and I recommend reading these as well. Also take a look at Yoga For Your Back and Restorative Yoga sequence for more ideas on home practice. I hope you enjoy doing your personal practice over the festive season. I wish you all a very good holidays! Sukhasana is one of the most simple and popular cross-legged seated poses and it's often used for pranayama and meditation practice. It is often translated as easy or comfortable pose and when you do this posture well, it can create a relaxed and yet alert state in both the body and mind. This is an ideal condition for pranayama and meditation practice. The name suggests it may be an easy pose to get to grips with but many people really struggle with Sukhasana. This is not surprising as we are more used to sitting on chairs or sofas than the ground. When we sit on chairs or sofas, there is a tendency to lean back and collapse the body. In meditation and pranayama, it’s really important that the spine is kept upright. Seated postures in yoga teach us how to sit straight and this helps to strengthen our core muscles. When we sit tall, our chests are kept opened and spacious, making it much easier to breathe in a relaxed and calm way. If you breathe properly, the mind can be clearer and more focused. In order to be able to cross your legs comfortably in this seated posture, you need certain amount of flexibility in the legs and hips. A regular asana practice helps tremendously. After all, one of the reasons asanas are traditionally practiced is to be able to comfortably sit and meditate. Postures such as Supta Baddha Konasana (lying cobbler pose) and Prasarita Padottanasana (wide stance forward bend) are particularly beneficial. Limbering movements like the Pawanmuktasana (wind releasing series) are also excellent warm up sequence to do to avoid cramps and pins & needles. Once you’re able to sit comfortably in Sukhasana, you will actually find that this pose is incredibly stable and grounding. When you can release your weight down properly, it’s easier to extend upwards more effortlessly. It’s also a great pose to keep your hips opened and relaxed. If you have a home practice, try to practice seated postures at the beginning and at the end of the practice. Notice how it feels at different times of your practice. It’s a great way to reflect and to create a more harmonious practice. It will also make it easier to sit for longer in Sukhasana. In fact the more time you spend in it, the better this pose will feel. So any time possible, try sitting in Sukhasana instead of using a chair or a sofa at home. At first try using a cushion, blankets and yoga blocks for support. You can even sit against a wall if you find it hard to keep the spine straight. I think one of the reasons why I’ve found seated postures fairly easy from the beginning is because I spent much of my early childhood sitting on the floor. I grew up in Japan and it’s in our culture to sit on the ground, although this is slowly changing due to Western influences. A well known yoga teacher in the UK once told me that she got rid of chairs and sofas and decided to furnish her house in an oriental style as she believed that sitting on a ground was so much healthier. I wouldn’t encourage everyone to go to this extreme but there are benefits gained from doing this pose regularly. When I sit in Sukhasana, I find that I can concentrate better and keep my posture intact. As I write this blog, I’m actually sitting crossed-legged on a chair! Keep practicing and it will become an easy pose for you too. I thought I would write about yoga for healthy backs because I recently hurt my back and had to modify my personal practice. Yes, yoga teachers sometimes do get ill and injured! In my opinion this can actually improve our teaching because we can understand what it is like and how to deal with it from a first-hand experience. Injuries can be frustrating and stressful but it can also be an excellent time to reflect and get to know ourselves better. After all, one of the most important elements of yoga practice is self-understanding. Illness and injuries are common part of living and now that we are all living longer, we are bound to encounter problems from time to time. In yoga, what is important is not necessarily whether you can do the pose well (or even at all) but how we deal with the challenges that we face. Try to take a moment to question, do you try and force yourself into a difficult pose without paying attention and listening to your body? Does your practice benefit and reflect where you are at the moment? Whilst you are injured, it is really important that you are sensitive and aware of the body so that you can adapt the practice creatively. Try to avoid doing strong poses or sequence. This is not the time to challenge yourself. Instead try to practice in a gentle, mindful way. Think of how we would act if your looking after those we love that are in pain. Whilst there are many different types of back problems, I thought I would try and provide a general tips and guidelines for practice. These are the movements and postures that I found particularly beneficial. If any of the poses or movements hurt, try modifying and if it’s still painful you can skip it altogether. Remember less is more. Doing a regular short gentle mindful movement is much more helpful for recovery. Make sure to consciously breathe through the whole practice. This will help you to relax and recover more quickly. Most of the practice is done on the floor to avoid compression and remove the pressure of gravity on the spine. Try experimenting different ways of lying that feels best for your back. Start by connecting with your breath and encouraging your whole body to relax completely. If it doesn’t hurt your back, try moving very gently in a circle, side to side or forward and back movement . Lie with your feet flexed and your legs engaged as if you are standing with your arms by your side. Slowly extend your arms over head. Try to get your arms and hands to touch the floor above your head. Repeat this movement slowly with your breath. Inhale, raise your arms and exhale release your arms back to the original position. Once you have repeated the arm rise, try holding the pose with your arm extended overhead and point and flex your feet several times. Use of a block is optional. In this exercise, you are gently moving from anterior to posterior pelvic tilt. Inhale arch your back slightly and tilt your hips forwards. Exhale gently pull your belly in and flatten your back. Move with your slow deep breathing. To strengthen your belly, hold in the posterior tilt position with the abdomen drawn in for several breaths and release. Repeat the hold few times. After the exercise, try to find a neutral alignment for your spine and relax completely. Start from semi supine pose and slowly release into the twist on an exhalation. On an inhalation, return back to centre. Repeat on the other side. Once you have completed several rounds, hold the twist for several breaths on each side. In this dynamic variation of the lying cobbler pose, we will be moving our legs in and out slowly with your deep smooth breath. Exhale bring the knee into wards one another and feet down on the floor. On your inhale return to the original position. Repeat this several times. When your ready hold cobbler pose for several breaths. If it’s a strain to hold this position, try using yoga blocks underneath the legs or use a yoga belt to support your hips. To make the final pose even more relaxing use folded up blanket underneath your legs and optionally use eye pillow and another blanket to cover yourself. Try and make yourself really comfortable so that you can relax fully. Feel free to use semi supine pose instead. In the ‘Developing a Home Yoga Practice part I’, I explored the benefits and importance of having a regular home yoga practice. In this second part, I will cover information and advice on how to start your home practice. There are many benefits from regular home practice. Over time, you will gain flexibility and strength not just physically but mentally. You will feel more relaxed and confident in your practice and your ability to concentrate will vastly improve. Overall you will feel more balanced and aware of yourself. One key advantage of home practice is that you become less reliant on other people and you can practice any time you want. You don’t need to find a suitable class every time you want to practice and you can tailor the practice to suit your needs. As your practice develops, you will gain the skills to become your own yoga teacher and learn to look after yourself better. Hopefully, by now you are wondering how you can start practicing yoga at home. In order to get started, it seems obvious but you need to get some yoga equipment like yoga mat and blocks. It’s not a must but you can also buy other useful yoga tools like eye pillow, yoga straps, bricks and bolsters. These tools can make your practice more enjoyable and they can easily be found on online yoga stores. If you don’t want to start spending money, you can use household items instead. For example, a scarf instead of a yoga belt. See my blog post on restorative practice for more ideas. Ideally, you want to find a practice area that is clean, airy and quiet – preferably a place away from distraction. If you have particularly busy house, you might consider practicing early in the morning before everyone gets up. Our muscles tend to be tighter in the morning so it might feel more challenging to begin with but your body will adjust in time. In fact, traditionally yoga is practiced very early in the morning and it is a wonderful time to practice. It will wake you up and you will feel great for the rest of the day. However if this time really doesn’t suit you, try different times of the day like after work or just before going to bed. It’s best to experiment and see what works for you. Personally I tend to do my practice at the same time every day. Doing your practice at the same time makes it easier to create a regular routine. If you cannot do a regular time and find it difficult to stick to your practice, try making appointment with yourself. You could try writing it down in the diary or note it down on the calendar so that you keep this time free and mark it as something important that you have agreed to do. After all, you wouldn’t forget or decide not to turn up to an important meeting with some one. To begin with, it’s best to try and do short regular practice - try doing couple of basic postures and sequences that you know well. At this stage, the most important thing is to establish the routine of doing yoga. It’s better to do 20 minutes everyday than to do an hour and a half practice once in a blue moon. You can then gradually increase the practice length over time. For inspiration, I recommend that you continue to attend your group classes regularly and take a look at yoga books and website for more ideas. It is said that there are over 840,000 yoga poses  available. Having this many choices can be great but it can also be confusing. Try not to do everything at once and take time to learn each posture well. Coming up with a balanced yoga sequence can be challenging and it can be hard to know which postures to do and when to do them. Try to notice the effect of each of the asanas so that you can begin to know what postures work well together. Yoga sequencing can be likened to cooking. First of all, it’s important to learn the basics. You can begin by following a recipe (or other people’s sequences) and once you have learnt the basics, you can begin to experiment and come up with your own unique flavours and practice. As a general rule, you want to try and have a definitive start, middle and end to your session. This will help to create a rounded practice. Try to spend at least couple of minutes settling and connecting to your breath. Do some warming up movements to limber the body especially before doing advanced postures like strong backbends or inversions. Towards the end of the practice, wind down by doing some more calming and relaxing postures. Make sure you always rest in Savasana at the end of your practice. Keeping a practice journal can be beneficial. You can see your progress easily and it will encourage you to learn names of the poses and breathing techniques. This doesn’t have to be long. It could be just couple of sentences. If writing something doesn’t work for you, try recording a journal on your phone. Encourage yourself to reflect on how the practice made you feel. Note down things like how your body felt, the qualities of your breathing and how the mind reacted during your practice. Write down what worked and what didn’t and your energy levels during and after the practice. Instilling a regular practice can be very challenging so try and persevere. It’s normal to have setbacks so try not to be too hard on yourself. Stay sensitive and notice small changes. Most of all enjoy your practice. Finally, there are other creative ways of brining yoga practice throughout the day. You can practice simple breathing techniques like Full Yogic Breathing whilst you’re walking down the street or do Tadasana (Mountain Pose) when you’re waiting for a bus. You could also do few simple stretches at work. I will leave you with a quote from K Pattabhi Jois, a renowned Indian Yoga teacher who developed Ashtanga Yoga, said ‘Practice and all is coming’.